Here we’ll publish articles by us and you. If you want to publish something here on our blog, send us an (encrypted!) email. 09.04.2019 NoPolGBW – no new police law in Baden-Württemberg! We found this article about a banner action at the International Day of Political Prisoners that we thought was worth sharing in a shortened version. “For a world free of cages! 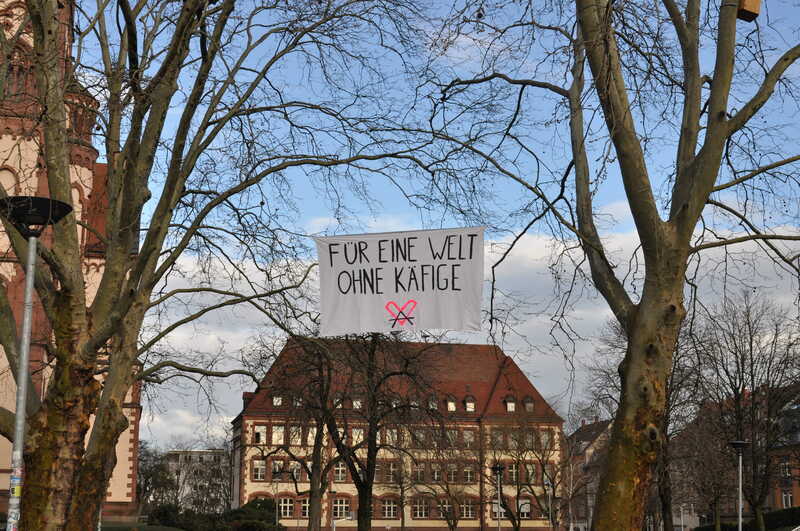 Banner action for the International Day of Political Prisoners in Freiburg in BreisgauOn the ocassion of the International Day of Political Prisoners on the 18th of March 2019, two banners were dropped in Freiburg in solidarity with all people enduring prison and repression. […]Repression and prison are especially used against people based on skin colour, nationality, il_legalisation, wealth and political leanings. Prison thereby serves a societal function of projecting and distancing of unwanted people and behaviours and punishing them. However, security is not achieved through punishment and exclusion – rather, the state strengthens its monopoly of violence by criminalizing certain actions, thereby reproducing social hierarchies and injustices. The prison system is thus incapable of producing justice, but achieves the opposite. 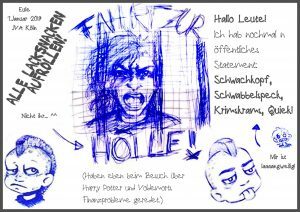 hambacherwald.org: After more than four month of pre-trial prison the trial against Eule started in February 4th. Eule is being charged for assaulting an officer (§114 Abs 1 StGB, §§ 224 Abs 1 Ziffer 2, 22, 23, 52 StGB.). Eule is still in prison and the trial will continue on the 18th at local court Kerpen. Write letters to Eule! Infos can be found here. barrikade.info: ‘After one and a half year behind bars in Berlin prisons for supposedly blinding a helicopter during riots in Rigaer Straße (squatted street in Berlin)’read more on barrikade.info (German) …Nero’s letter from behind the bars (in German) can be found here. 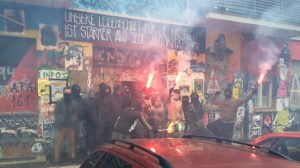 The sentences against the Basel18 standing trial for a wil demo in Basel, range from 2 years probation to 27 months in prison. The case will go to the next instance. More info (in German) here. Trial for allegedly resisting and attacking an officer at Amtsgericht (local court) Mannheim 21.01.2019 starting 11 am. Meeting point 10.30 am in front of the court, Schloss Westflügel, Bismarckstraße 14. As always: if you are searched for by the cops or took part in the NBA actions and haven’t been caught. Dont show up.